The summer in between high school and college often winds up being a pivotal time. Feelings of nostalgia and sentimentality color every single experience, particularly for those who have decided to leave their hometowns in pursuit of higher education in some other city, state or even country. The longing to linger in the familiar is strongly felt, even as the excitement of a new adventure begins to draw us out, each feeling fighting for dominance during hazy, lazy summer days and nights. 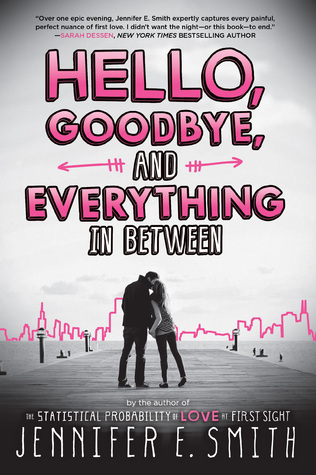 It is no easy feat, but Jennifer E. Smith captures these feelings in her latest novel Hello, Goodbye, and Everything in Between. It is the last night before they part ways, and Clare and Aidan are still trying to figure out whether or not to keep their relationship going in spite of the fact that they’ll be on opposite sides of the country. In one night, readers get to relive the past, embrace the present and think about the future alongside these two lovebirds. It might seem like a decision easily made, but as someone who has had to make the choice about long-distance relationships, I can certainly say that the way these two teens are trying to figure out what’s right for them makes absolute sense. Their romance is sweet and believable, young love between two teenagers who are trying to figure out their next steps forward as their lives roll on. The night is not just about their romance though, as Smith cleverly finds ways to integrate friends, family and even their hometown into this story. The night serves as a physical embodiment of love letter to this place, to their relationships, to the memories and stories and things that have changed their lives (whether for better or for worse). While it isn’t a permanent goodbye, it certainly had the feel of a fresh chapter, a new part of the story where what they had will be relegated to flashbacks, old photos and conversations reliving the “good ol’ days”. And with their heightened emotions as the night wears on, it’s no surprise that Aidan and Clare experience some perspective shifts and unexpected twists too. 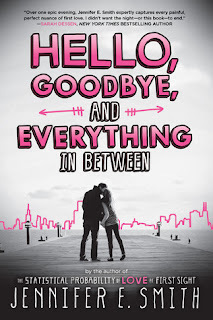 I savored my read of Hello, Goodbye, and Everything in Between, unabashedly enjoying the way it transported me back to my own pivotal eras, the moments when life as I knew it was going to change forever. Smith’s ability to capture emotions in a way that evokes them in the reader, as well as her easy to read style, certainly add to this book’s appeal. I really enjoyed Aidan and Clare’s story, and I’m certain many others will too. Great review, you completely got me hooked. I read The Statistical Probability of Love at First Sight by Jennifer E. Smith quite a while ago and I had mixed feelings about it, which is why I haven't really looked at any of her other books. It might be time to give her another chance, though. I've read two of her other books. I can't wait to read this one! Thanks for the review! Lovely review Alexa. I had a bit of a disconnect with this one--perhaps because it did not at all mirror my own college experiences?--and am still a bit sad I couldn't read it with the same level of enjoyment that you obviously did. Thank you for giving me a bit to think about as I work on writing my own review as well! I've been thinking about picking up another Jennifer E. Smith book (I read The Statistical Probability of Love at First Sight a few years ago) and this one sounds like a great place to start! It sounds like it'll be full of emotion and I love stories that make you feel nostalgic. Jennifer E Smith does such a great job of capturing those pivotal moments in our lives, so I'm not surprised to by your review! I don't think this book is for me, in turns of romance, but it sounds well-written and emotional. I'm glad you enjoyed, Alexa! Lovely review! I think I need to have this book in my life! Your review was great - and now I can't wait until September 1! This book also made me feel nostalgic about specific milestones in my life. I adored this book, I really want to savor it. On a side note, I love the way you write! Wonderful review Alexa! I'm looking forward to reading this one. I'm sure it'll bring me back to my days when I left home for a new city.